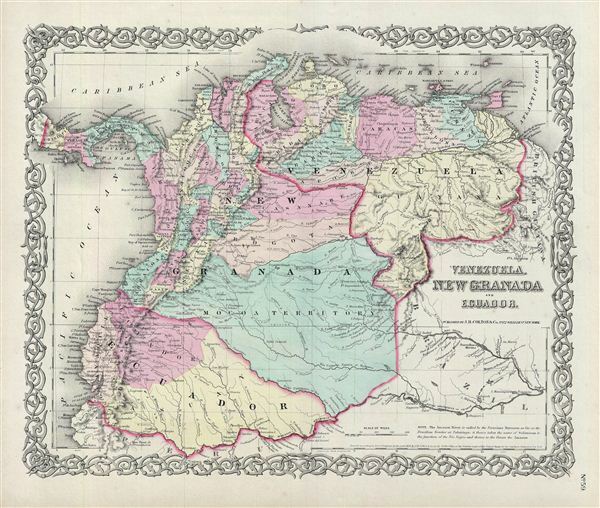 An excellent 1855 first edition example of Colton's map of Venezuela, New Granada (Colombia), and ecuador. This map covers from the Pacific to Guyana and from Peru to the Caribbean, including Panama. Simon Bolivar's vision of Gran Columbia was proven untenable and in 1829 and 1839, respectively, Venezuela and ecuador became independent nations leading to period of political upheaval and civil war throughout the region. Venezuela dissolved in the bloody Federal War (1859-1863) in which a significant percentage of the population would perish. Colombia became the Confederación Granadina, a short lived federal republic that consisted of modern day Colombia and Panama. The Confederación, facing strong opposition from both liberal and conservative elements, dissolved in 1863 in the midst of the Colombian Civil War (1860 – 1862). This map also identifies various cities, towns, forts, rivers, rapids, mountain passes, fords, and an assortment of additional topographical details. Map is hand colored in pink, green, yellow and blue pastels to define national and regional boundaries. Surrounded by Colton's typical spiral motif border. Dated and copyrighted to J. H. Colton, 1855. Published from Colton's 172 William Street Office in New York City. Issued as page no. 59 in volume 1 of Colton's 1856 Atlas of the World. Rumsey 0149.064 (1856 edition). Phillips (Atlases) 816.